In the early 19th century, New Zealand’s doors were open to all. But in 1881 the first barriers were set up, to hold back Chinese immigrants. By the 1920s, it became harder for anyone who was not British to get in. Russians, Italians, Japanese, Africans – people from all over the globe faced restrictions. There was a ‘White New Zealand’ policy in practice, if not in name. By the end of the 20th century, however, other conditions were applied to immigrants, such as whether they had job skills or financial assets, or were in need of refuge. After 1840 and the signing of the Treaty of Waitangi, anyone could enter New Zealand freely, but those who were not British were regarded as ‘aliens’. The first restrictions began in 1881. Chinese people wishing to settle in New Zealand had to pay a fee known as the poll tax. It was believed that New Zealand should become a ‘Britain of the South’, rather than accepting Asian people. The government was also worried that the Chinese would take jobs that New Zealanders wanted. Other non-British immigrants who arrived later faced some barriers. But people of British descent could settle freely until the 1970s. Some people opposed the harsh immigration laws when they were passed. Later generations were ashamed of this discrimination against Asians and others. In 2002 the prime minister apologised to the Chinese community for the suffering these rules had caused. In the early 20th century, after the First World War, there were restrictions on Germans and people with certain political beliefs entering New Zealand. From 1920 until 1974, the minister of customs could exclude any people who were ‘unsuitable’. This usually meant those not born in Britain or not of British heritage. The 1920 Immigration Restriction Amendment Act was intended mainly to reduce Asian immigration, but did not stop it completely. In the last quarter of the 20th century the rules changed, and people were no longer stopped from immigrating because of their race or nationality. They were accepted because of job skills, financial assets and family relationships. Refugees seeking safety from persecution or death in their homeland were also admitted. 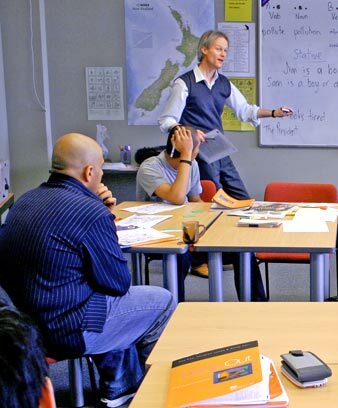 But the most important factor was whether an immigrant could help New Zealand’s economy. It became easier for Asian people to immigrate in the 1970s. New laws in the 1980s finally ended the ‘White New Zealand’ policy. Australian citizens have always been free to enter New Zealand. There are special arrangements for Pacific Islanders, and some enjoy free entry as New Zealand citizens.